I have had the priviledge to work with these two gals for the last 12 years and admire their dedication to reducing pet over population. Helping these girls with their goal, you might say this is one of my “Pet” projects. 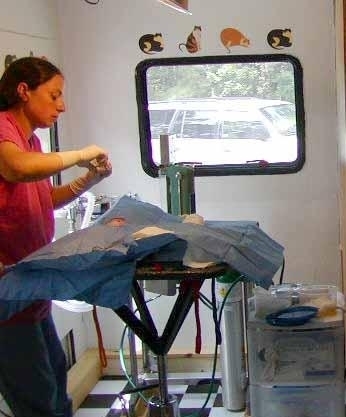 Leftoverpets/Pet Mechanics, a Georgia 50Ic non profit has sterilized literally thousands of dogs and cats in rural Ga counties from their inception in 8/2005 to today . In fact, they have hit a MILESTONE of 35,000 surgeries. Yes, over 35,000 surgeries have been performed. Because of your generousity, Dr. Polvere and her assistant Susan Thompson, have set up a surgery suite in Barrow County. This allows them to spay and neuter dogs of all weights. The demand for their services is great but much needed funds are needed to keep them on the road. As with all things their costs are going up and funds are needed, so our quest for donations goes on. They need your help to stop the overpopulation of unwanted pets and the needless killing of thousands of precious lives each year. Leftover Pets also rescues dogs from high kill shelters on a regular basis and transports them to the north where they can find forever homes. They have saved literally 100’s of dogs destined for euthanasia at the shelters. Transports are made on a monthly basis to rescue groups in NY, NJ and VT. This venture too is a costly one but for every transport many deserving animals find loving forever homes. To make a tax deductable donation you can mail a check to Leftover Pets, PO Box 588 Danielsville, GA 30633. Or you can also make a donation online @ www.Leftoverpets.org. Your help is greatly needed and appreciated. Please visit their website @ http://www.leftoverpets.org/transport.html. There is no extra charge if a female is in heat or pregnant. Large dogs now accepted. We do NOT accept walk up clients so please call today to schedule an appointment. Financial assistance programs are available for clients on a fixed income. Please inquire when you call about an appointment.